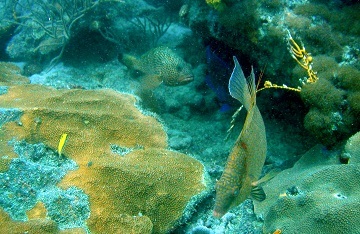 Camouflage is one of the best evolutionary strategies there is for evading predators, and hogfish are masters of it. These pointy-nosed reef dwellers change skin color so rapidly to match their surroundings — literally in milliseconds — that it seems impossible for them to rely only on their eyes to perceive those surroundings. As it turns out, they don’t only use their eyes. Hogfish skin can “see” too. Scientists recently analyzed hogfish DNA and learned how this skin vision, called dermal photoreception, works. Hogfish skin cells include chromatophores, which contain a pigment that’s sensitive to light. When these cells sense light patterns, they can mimic those patterns by manipulating the distribution of their pigment, spreading it thin or clustering it together. But scientists also wanted to understand how hogfish skin detects light in the first place. Octopus and cuttlefish also rapidly change skin color to blend into their environments. Their skin uses the same basic mechanism that their eyes use. But that’s not how hogfish skin works. Duke University biologists compared genetic material in hogfish skin to genetic material in its retina, the sensory membrane at the back of the eye. They found the fish’s skin and eyes use different genes to detect light.